If duplicate contact records are created in Nimble from your Wufoo forms (using Wufoo integration), there could be a problem with your Wufoo Webhook connected Nimble. Webhooks enable a web application to send data from its server when something happens (a trigger). Wufoo Webhooks push data out when it arrives in Wufoo (the trigger). So when a lead fills out your Wufoo form and hits submit, that data goes into Wufoo, then pushed out to Nimble. 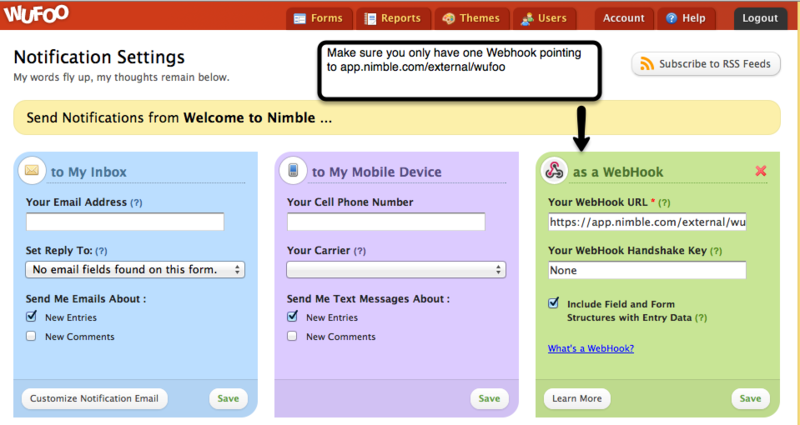 In other words, when you link your Wufoo account to Nimble in Settings >> Integrations, a webhook is created. The reason why you may be getting duplicate contact records could be that you have more than one Wufoo webhook connected to Nimble. When this happens, each webhook pushes the exact lead to Nimble, creating a duplicate record. If you have more than one webhook, delete the duplicate ones. This should stop the duplicate records being created in Nimble now.